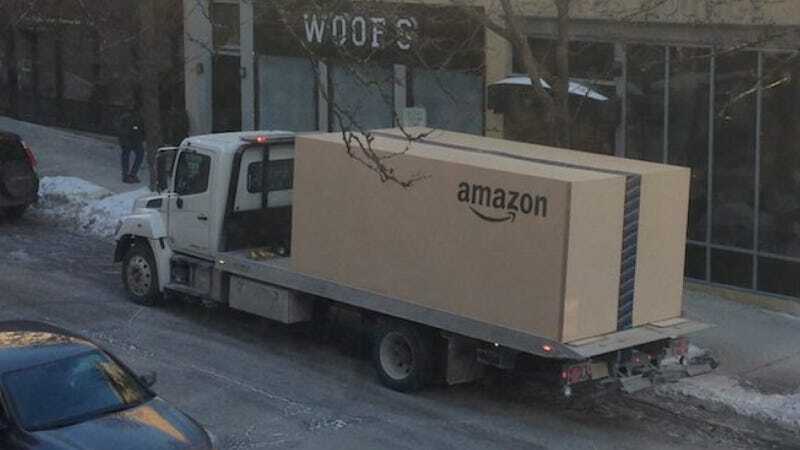 AdAge confirmed that the giant Amazon box Reddit was abuzz with speculation over was indeed real, and contained a 2014 Nissan Note. Nissan's PR team filmed the unorthodox delivery of this Note and two others to their new owners with the intention of putting together a video for social media. Since the "spy photo" racked up about 1.5 million hits in a day on its own, maybe now they won't bother. Nissan removed the cardboard from where they left the cars, which is too bad because it would have made one hell of a fort. Or the shortest-lasting carport ever. Instead, they left behind $1,000 Amazon gift cards. I guess the recipients could use that to buy a real carport, so it's all good.